Georgina Hogarth, sister-in-law, housekeeper, and adviser of English novelist Charles Dickens and the editor of three volumes of his collected letters after his death. One page, 12mo, good condition. "I am much obliged to you fro sending me copies of those two interesting letters to Mr. Charles Dickens. 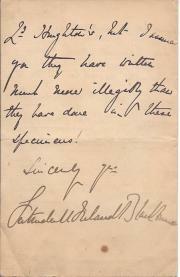 I will not ask you to take the trouble of sending the originals as I have not the slightest doubt of their authenticity." [Henri Cernuschi, Italo-French banker and collector.] 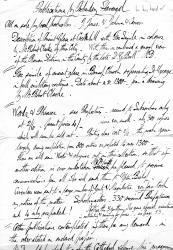 Autograph Letter Signed to the London parliamentary bookseller Philip Stephen King, apologising for not being able to supply him with autographs, as his collection has been stolen 'toute entière'. On the letterhead of his Paris mansion at 7 Avenue Velasquez, Parc Monceau [now the Musée Cernuschi]. 29 April [c. 1889]. 2pp., 12mo. Bifolium. In good condition, on aged paper, with slight wear to one corner. Signed 'H. Cernuschi'. 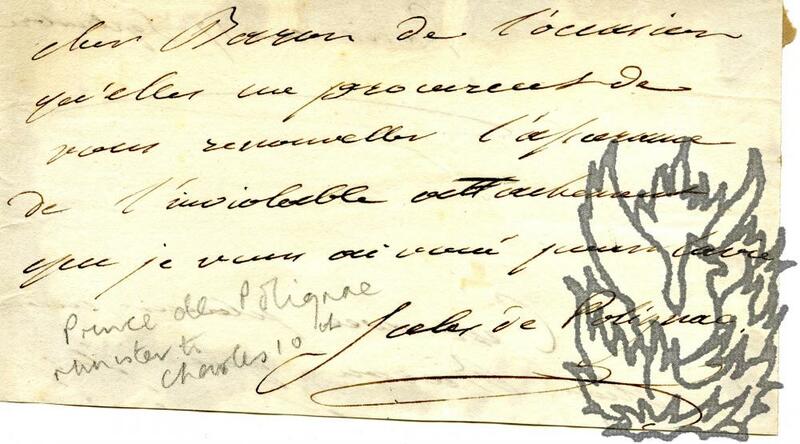 He begins by stating that from King's 'première lettre' he had recognised his handwriting. 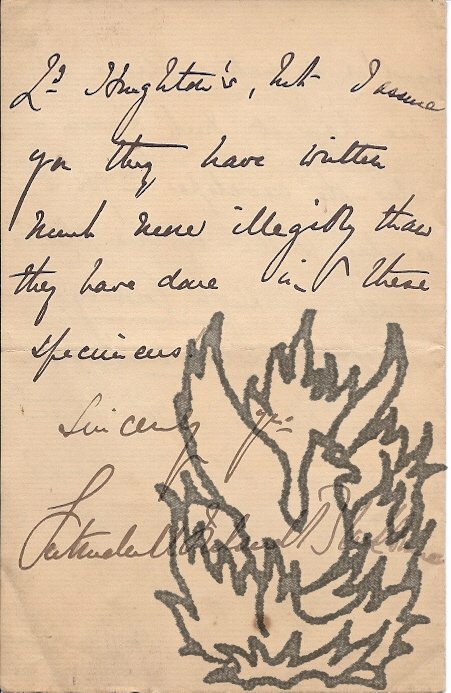 He apologises for not being able to comply with a request of King's: 'Je possédais une importante collection d'autographes - mais elle m'a été volee toute entière'. He concludes by instructing King to send to Westminster '600 copies de Bimetalism in England aand Abroad et 50 copies de mon Speech a Paris 1889'. 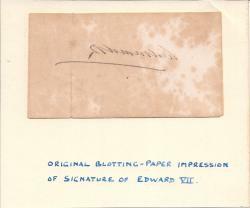 Autograph Signature ('Edward German') of the English composer Sir Edward German, on part of letter. On 8.5 x 11 cm piece of paper, cut from the bottom of a letter. In good condition, lightly-aged. Entirely in German's hand. The side of the letter with the signature reads: '[...] write you, & I hope we may be able to arrange a meeting. | Yours sincerely | Edward German'. The other side reads: '[...] you at Sidcup with the Georges many years ago. | I should be very pleased to meet you again, but at present I seem to be fully occupied [...]'. Autograph Signature of the British novelist Margaret Kennedy [Margaret Davies, Lady Davies]. On one side of a piece of 11 x 11 cm paper, cut from the bottom of a letter. In good condition, lightly-aged. Reads, all in Kennedy's hand: 'Yours sincerely | Margaret Kennedy'. Autograph Signature ('Bernard Partridge') of the 'Punch' cartoonist Sir John Bernard Partridge. 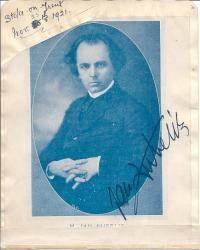 Photograph from magazine signed Jan Kubelik, on detached leaf of album. Jan Kubelik, Czech violinist and composer, and others. Leaf detached from album, some staining, complete and clear. 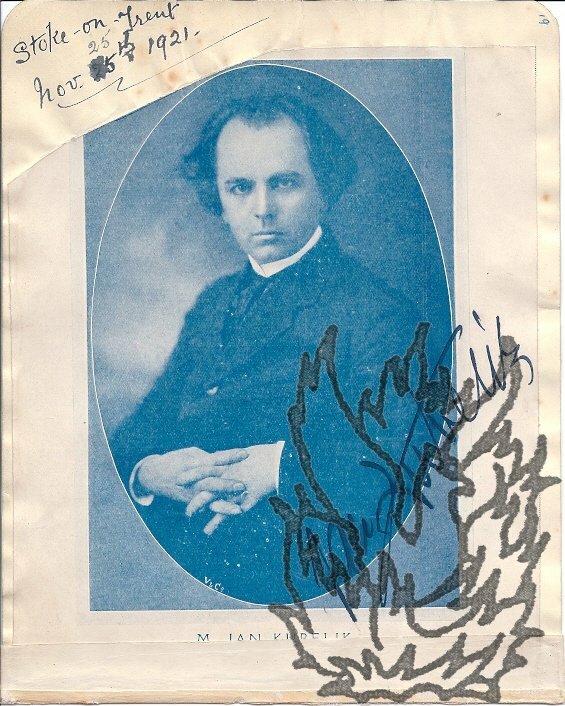 On one side a photographic portrait of jan Kubelik which he has signed and which has been annotated with the above place and date. Overleaf appear the signatures of Phyllis Neilson-Terry, actress and the Russian tenor, Stefan Bielina, dated by him 9/12 1921. 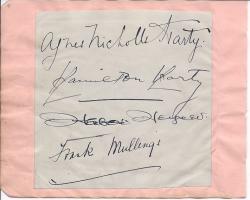 Page detached from album, some wear and tear but no losses, which contained numerous autographs provided at performances in Stoke mainly in the 1920s. 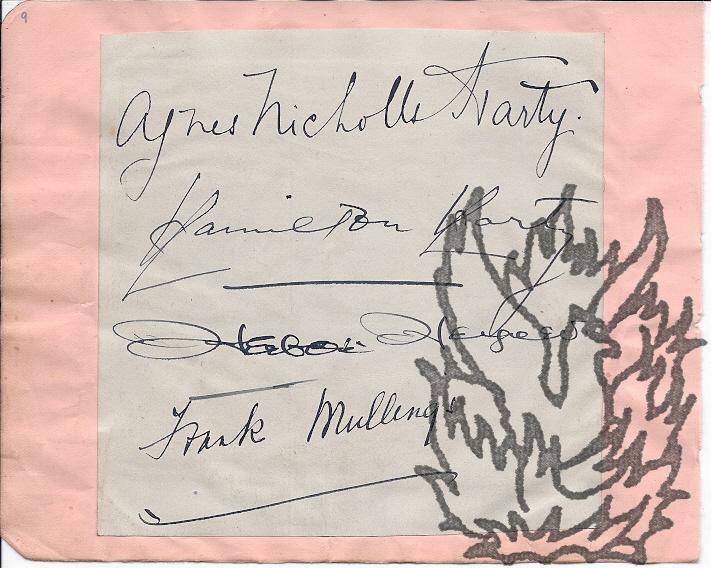 One side of the leaf has the signatures of Agnes Nicholls Harty, Hamilton Harty, an illegible, and Frank Mullings, while overleaf are the signatures of John Booth, Margaret Balfour and Andrew Clayton. 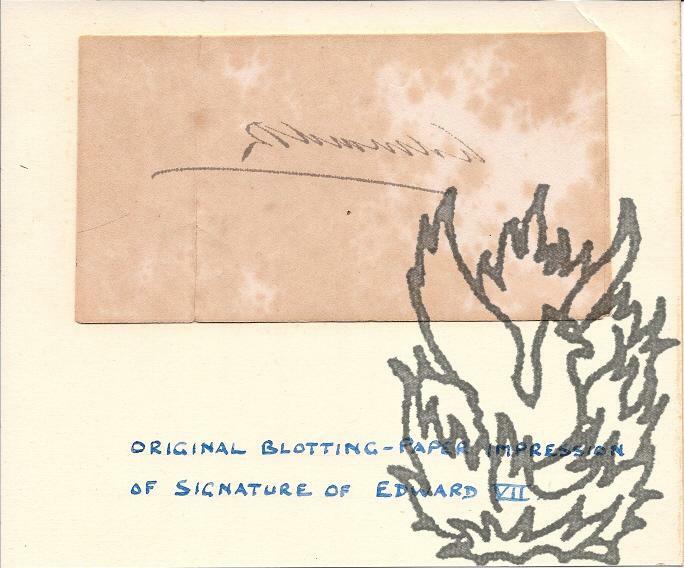 Bold signature and image on detached album leaf. Florence Austral, Australian opera soprano. 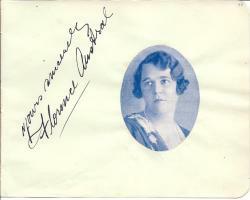 No date but another example of her signature from the same album was on same page as Elgar's, dated 1922 (Stoke) . 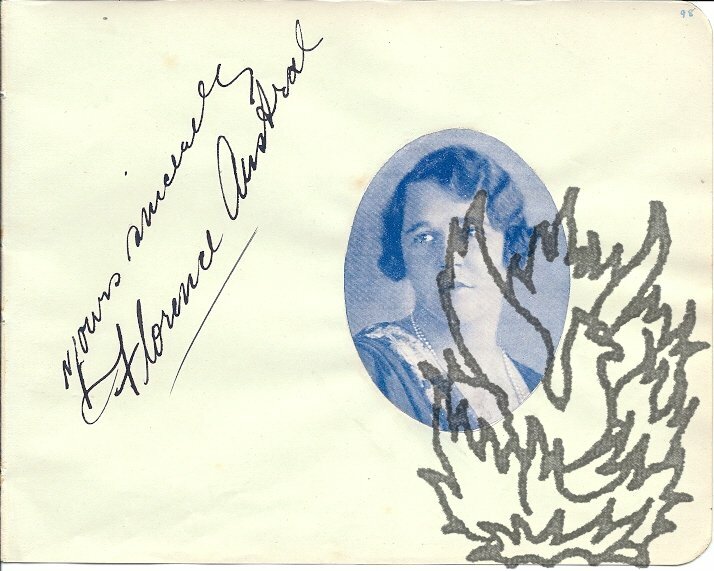 Deatached page from album, 17 x 14cm , good condition, yours sincerely | Florence Austral [underlined], with image of head and shoulders cut from magazine and laid down. Autograph Letter Signed from the Victorian author Gertrude Mary Ireland Blackburne ('Gertrude M Ireland Blackburne'), to 'Mr. 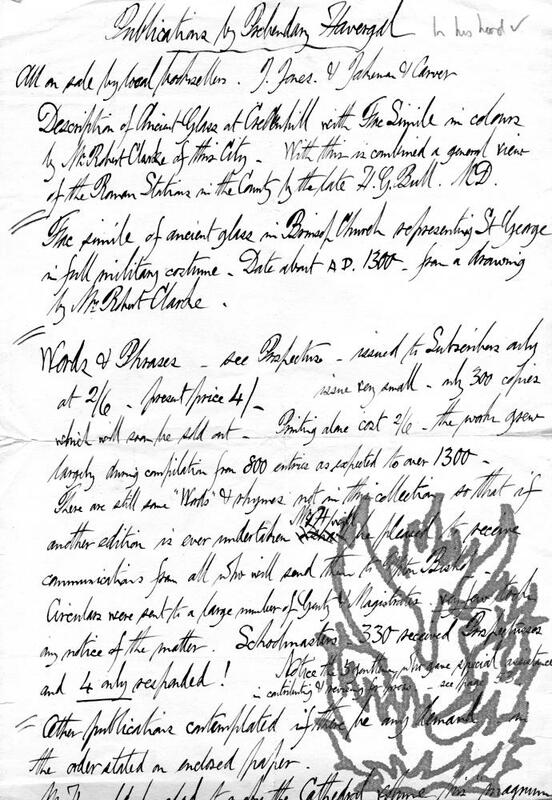 Parker', concerning autographs, including those of Charlotte Yonge and James Payne. 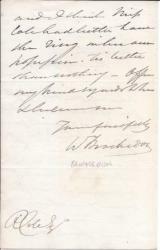 15 September 1886; on letterhead of Roodee Lodge, Chester, Lancashire. 12mo, 4 pp. Bifolium. 32 lines. Text clear and complete. Fair, on aged paper. In answer to a request for autographs, she has 'some duplicates somewhere, but tonight I send you only three cards', as she has 'no letters of Miss Yonge that I should like to part with'. She names the authors of the 'three signed postcards' (not present) as: James Payne ('Editor of Cornhill, author of many novels'), Charlotte Yonge and Richard Monckton Milnes, Lord Houghton. Autograph Prices Current (Published Annually.) 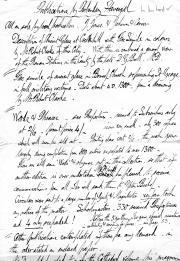 Being a Complete Alphabetical and Chronological Record of all Autograph Letters, Documents & Manuscripts, Sold by Auction in London, with the Date and Place of Sale, Name of Purchaser, and Price [...]. Six vols [all published]: 1916, 1917, 1918, 1919, 1921, 1922 [covering years 1914 to 1922]. First vol: London: E. H. Courville, 25 Rumsey Road, Brixton, S.W. . Sixth vol: London: A. J. Herbert, 1, Barton St., Westminster, S.W.1.. The six vols are uniformly octavo, in original blue cloth gilt. Good, on lightly-aged paper. In worn, spotted binding, with gilt on spine dulled. Each volume opens with several leaves of advertisements for dealers (ranging from Maggs and Quaritch to James Tregaskis and Frank Hollings) and a preface by the editor (that of 1918 describing as the 'outstanding features of the past season [...] the two sales of the Alfred Morrison Collection and the two 'Red Cross' sales'). Still a valuable reference tool, with many of the entries including a precis of the item or quotation from it. The first sixteen volumes of 'The Autograph Collectors' Journal', retitled, from vol.5 no.4 (Summer 1953), 'Manuscripts'. Vol.1, no.1 (Chicago: The Norman Press, 'Published by The National Society of Autograph Collectors', October 1948) to vol.16 no.4 (Chicago: 'Published Quarterly by the Manuscript Society', Fall 1964). Sixteen vols, the first seven quarto and last nine octavo. Index to vols.1-11 loosely inserted. Good (apart from issue for Summer 1957 which has slight damp damage), crudely bound in eight volumes of blue cloth, with titles in neat manuscript on white label on spine (one of the bindings stained and two in a lighter shade of blue with titles stamped in gilt). Well produced and profusely illustrated, with informative and scholarly articles, advertisements, and sections on 'the auction market' and 'manuscripts in the news'. Treaty for the Limitation and Reduction of Naval Armaments, between the American, French, British, Italian and Japanese governments, signed by eleven of the plenipotentiaries, including three prime ministers (Macdonald, Briand and Wakatsuki). 8vo, 34 pp + blank last page. Unbound and stapled. 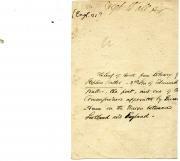 Fair, with central vertical fold, on slightly-aged paper, with light staining to the first and last pages. Signed on the first page by [three Americans] Henry L. Stimson; Charles F. Adams III; Dwight W. Morrow; [one French] Aristide Briand; [two British] J. Ramsay Macdonald; A. V. Alexander; [one Italian] Giuseppe Sirianni; [and all four Japanese representatives] Reijiro Wakatsuki; Takeshi Takarabe; Tsuneo Matsudaira and Matsuzo Nagai. 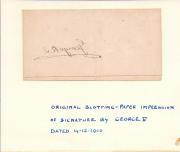 Autograph Note Signed ('R. Garnett') to 'Poole'. 6 February [no year]. On embossed British Museum letterhead. 12mo, 1 p. Text clear and complete. 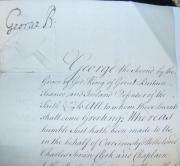 Good, on lightly-aged paper with remains of stub from mounting adhering to one edge. Reads 'We shall be very glad to accord Miss Rosamund hospitality on Saturday'. From a small archive of Lane-Poole material. 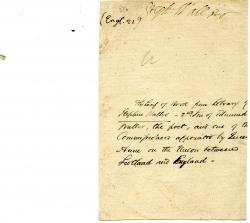 Autograph List of 'Publications by Prebendary Havergal. All on sale by local booksellers. J. Jones. & Jakeman & Carver'. With publication details of his 'Herefordshire Words & Phrases'. On one side of a piece of foolscap (33 x 20.5 cm). Text clear and complete. On aged paper, with wear to extremities and slight loss to bottom right-hand corner. Three items are listed: 'Description of Ancient Glass at Credenhill' (1884), 'The simile of ancient glass in Bristol Church representing St George in full military costume' and '[Herefordshire] Words & Phrases' (1887). Havergal adds nine lines of annotation to the last item, beginning: '- see Prospectus - issued to Subscribers only at 2/6. present price 4/- issue very small - only 300 copies which will soon be sold out. Visitors Book. 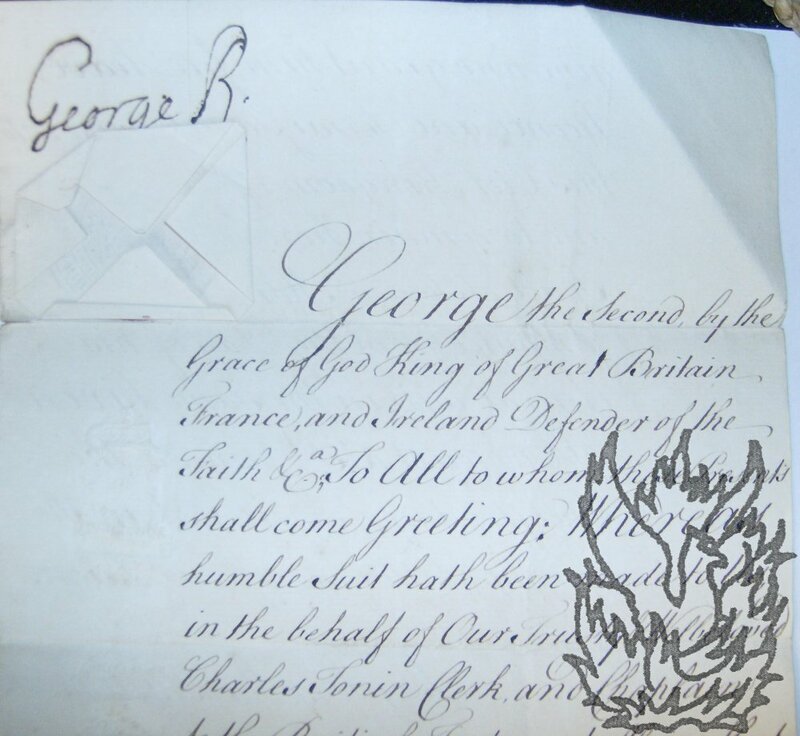 General Sir F J. Davies | General Officer Commanding-in-Chief | Scottish Command', containing the signatures of several high-ranking British military officers. 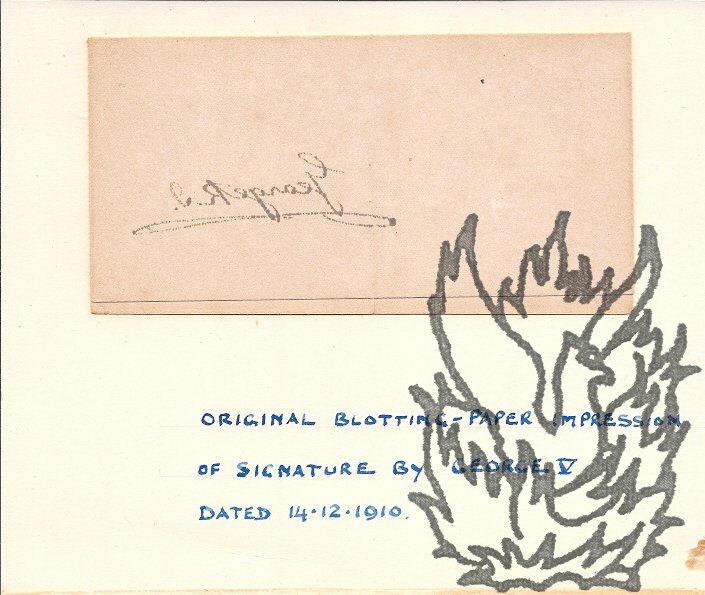 First entry dated 11 March 1920. Last entry dated 4 June 1923. '27 Drumsheugh Gardens, Edinburgh'. A quarto volume, bound in padded green leather stamped in gilt on the front cover with the words 'Visitors' Book'. Patterned endpapers. Tight, on lightly aged and spotted paper. Binding heavily worn, with outer corners of front cover dogeared and torn to show padding. Five leaves with one dogeared corner. Note (in Davies' hand?) on flyleaf: 'Visitors book. | General Sir F. J. Davies | General Officer Commanding-in-Chief | Scottish Command | 27 Drumsheugh Gardens | Edinburgh'. Each page with printed columns for the 'date' and 'name and address'. Autograph Signature ('Steph: Waller') on detached flyleaf of a book, with shelfmark in autograph. 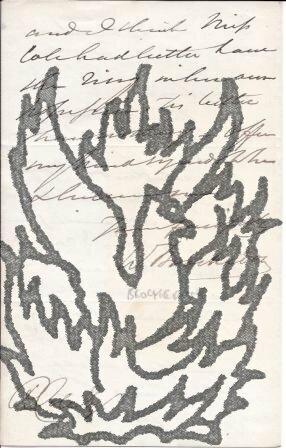 On a piece of laid paper, roughly 14 x 9 cm. Good, on lightly aged and spotted paper. Reads 'Steph: Waller | (Eng. 21)'. 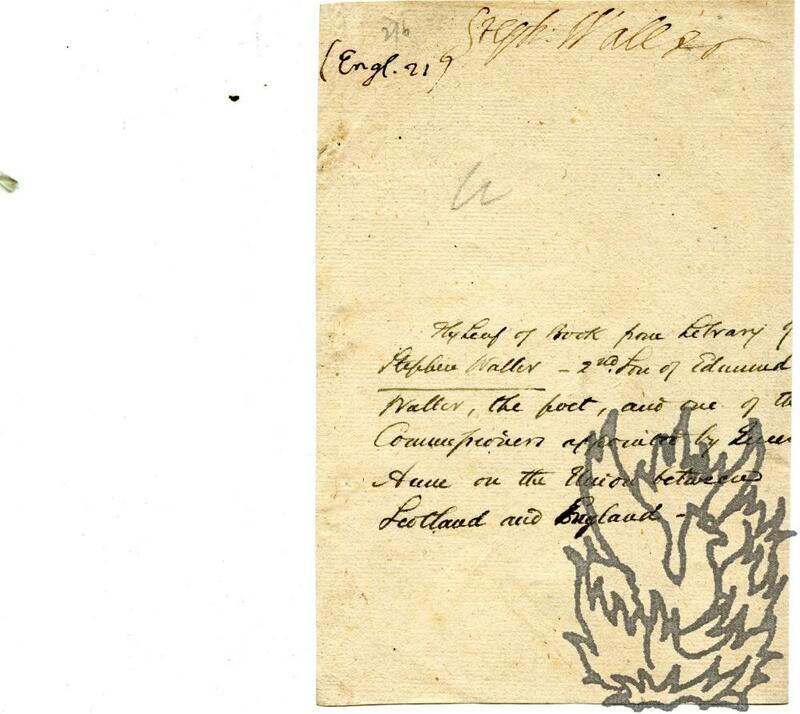 Docketed in ink on lower part of same page: 'Flyleaf of Book from Library o Stephen Waller - 2nd. Son of Edmund Waller, the poet, and one of t Commisisoners appointed by Quee Anne on the Union between Scotland and England -'.